Use Allied Bank to Win Flights ~ Philippine Freebies, Promos, Contests and MORE! 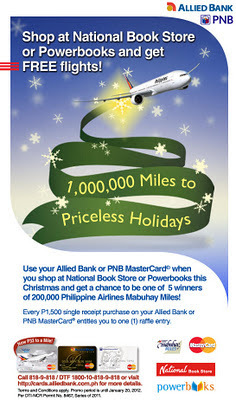 Allied Bank and PNB lets you enjoy the holiday season in their latest shop and win flights promo. A single spend of P1,500 at any National Bookstore and Powerbooks branch entitles you to one (1) raffle coupon. Fill out and drop this in drop boxes found in the stores' customer service area. Get drawn and be one of the lucky winners of 200,000 Philippine Airlines Mabuhay Miles. NOTE: You need to enroll in the Philippine Airlines' Mabuhay Miles frequent flyer program for you to enjoy the reward.